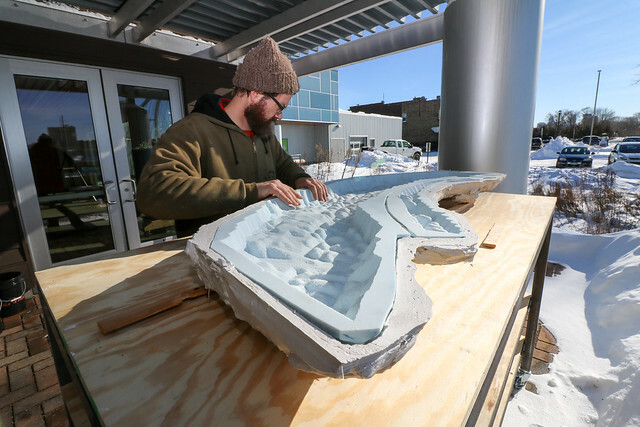 Created by local sculptor Aaron Dysart, “Watershed” was a time-based sculpture crafted from frozen ice water from the Mississippi River. Dysart used actual bathymetric data collected by MWMO staff to create a 3D mold of the river bottom north of the Upper St. Anthony Falls Lock and Dam. He then filled the molds with river water, allowed them to freeze and assembled them into a 3D model of the river. The length and width of the river were proportionally accurate, while the depth was magnified in order to better reveal the contours of the river floor. The sculpture was allowed to melt and then re-cast several times during the course of the exhibition. Aaron Dysart was a fiscal year 2015 recipient of an Artist Initiative grant from the Minnesota State Arts Board. This activity is made possible by the voters of Minnesota through a grant from the Minnesota State Arts Board, thanks to a legislative appropriation from the Arts and Cultural Heritage Fund. The bathymetric data was collected as part of an ongoing research project funded by the Minnesota Environment and Natural Resources Trust Fund as recommended by the Legislative-Citizen Commission on Minnesota Resources. The MWMO, the Minneapolis Riverfront Partnership and the Minnesota Department of Natural Resources are partners on the project.